My conference paper on “Implementing Digital Parliament Innovative Concepts for Citizens and Policy Makers” went first online on 13 May 2017. 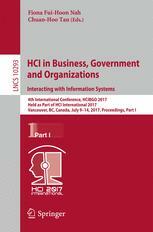 The organizational stability of Parliaments comes in direct contradiction with rapid progress in digital technology in recent decades, particularly in the ICT domain. By participating in a series of networking activities through European funded research programs, the Hellenic Parliament and the Austrian Parliament have placed themselves in the forefront of parliamentary innovation. This paper will focus on these activities and relevant findings on their impact, citizen adoption and application-to-end-user acceptance, where end users are parliaments and citizens alike. A range of technological challenges that modern Parliaments face and discrete actions of parliamentary innovation will also be shown. Finally, the paper will present the prospects that arise from the use of the latest ICT technologies in Parliaments. We shall also examine limitations in the use of such tools and shall propose potential areas of technological research and innovation for parliamentary application.